How Captain Chesley Sullenberger's skill saved 155 lives: "As flight 1549 climbed away from New York's La Guardia Airport, Jeff Kolodjay leaned back in his seat and smiled at the thought of the golfing trip ahead of him in sunny North Carolina. It was the coldest day of the winter in New York with temperatures way below zero. 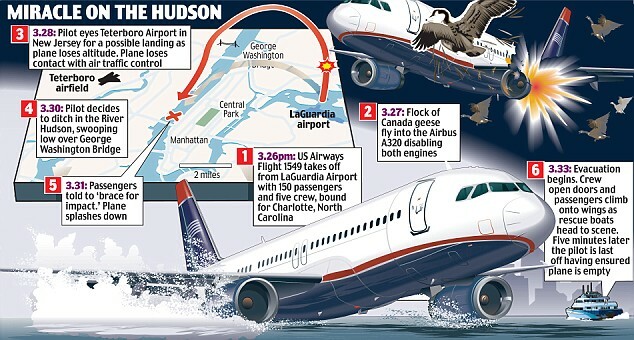 The ten-year-old Airbus 320 ascended smoothly to 2,800ft, then 3,200. It had been snowing on Thursday morning and Mr Kolodjay took in the picture-postcard view below him of Washington Heights and the Hudson River."